When Brian Carderelli graduated from James Madison University with a degree in digital video in May of 2009, he dreamed of adventure, travel, and documentaries; perhaps even a future with an organization like National Geographic. The world of film-making was wide open to him and the skill he possessed when looking through the lens of a camera would soon blossom. The following summer gave him his first intense experience in filming and editing when he landed a videographer internship at a Young Life Camp near his home in Virginia. An Eagle Scout, Brian loved the outdoors and was always eager to experience any adventure set before him; rock climbing, hiking, surfing, horseback riding, skiing and snowboarding were some of his favorite activities. His gentle nature and quick-witted sense of humor endeared him to young and old alike and was often a source of strength and inspiration in difficult situations. But in spite of his lofty dreams, Brian was not interested in self-promotion. While in high school and college, summers would find Brian working as a camp counselor, and most winters he spent teaching snowboarding or skiing to young children at Massanutten Ski Resort. “We were traveling to our destination on the side of a mountain,in a place that redefined the ‘middle of nowhere’. Our bus was having trouble making it up the mountain due to a tropical storm that was washing the road into mud. Because of the conditions, the entire bus had to be evacuated and we walked up the muddy hills. I had been wearing cheap flip flops which broke. So there I was walking barefoot up these inclines, (sliding was more like it), and Brian came over and asked if I wanted a piggy-back ride. I gratefully declined, and instead of carrying me up the mountain, he took off his shoes and walked barefoot beside me. We slopped our way to our destination, and were muddy as pigs by the end, but I will never forget the small sacrifice Brian made for me." 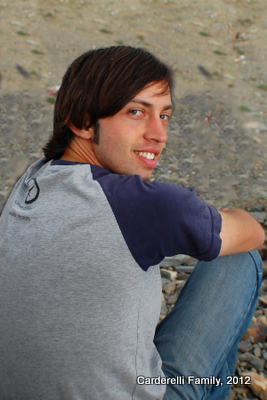 In the autumn of 2009, Brian accepted an invitation to go to Afghanistan to produce promotional materials for an international school and several other NGO’s (non-governmental organizations). All of the NGO’s were serving the war-torn country through various developmental projects such as education and health-care. Most were working within a tight budget, so Brian willingly volunteered his services with little or no pay. It wasn’t long before his aspirations to work for a notable agency began to give way to a growing concern for needy and oppressed people like those he was encountering in Afghanistan. 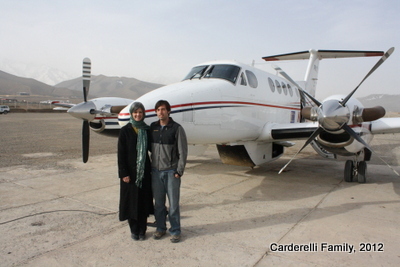 July 2010 presented Brian Carderelli with the opportunity of a lifetime for such an adventurous spirit, when a team of doctors, nurses, and translators invited him to accompany them to a remote region of Afghanistan. They would offer eye, dental, and mother-and-child care to a very needy group of people who had no access to any kind of health care. Brian would film their work in order to make a promotional video and to provide footage for a documentary. Because heavy fighting by several insurgent groups was common along the direct route to the village, the team opted for a much more strenuous, but less risky journey. 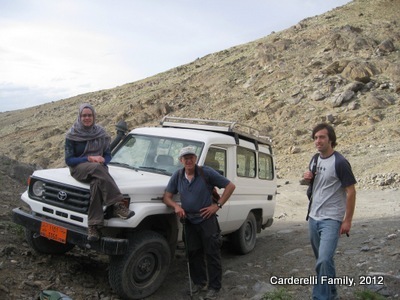 They traveled to a northern city by air, then drove for two days in Land Rovers, and finally reached the village after a treacherous two-day hike that included a 16,000 foot mountain pass. They spent a week treating hundreds of villagers, some of whom had walked for days to receive medical care. The return trek proved too difficult for the pack horses that were to accompany them, so the team had to carry all of the medical and camera equipment themselves. They encountered freezing rain at 13,000 feet and blinding snow at 16,000 feet. The well-seasoned leader of the group, Tom Little, stated that he had never seen anything like it. Soaked to the skin and with blistered feet and aching legs they reached their destination on the other side of the mountain and spent the night in a shepherd’s hut. The next day they hiked the rest of the distance to the waiting vehicles and began the last leg of the trip toward home. However, they didn’t get very far before being confronted by a group of militants who quickly gunned down ten of the eleven team members, including Brian Carderelli. Brian Carderelli's death is deeply painful for his family and friends, but at just 25 years old, he has left a legacy of faith and service that are inspirational to all whose lives he touched. Have a Memory of Brian Carderelli or pictures of him to share? Do you have a memory of Brian Carderelli? Share it with his friends and family - they will greatly appreciate it. Have some unseen-before-photos of Brian?....we know how photogenic Brian was!